Apparently, not everybody’s parent wanted them to be a doctor or engineer right from when they were little. Banana hit maker, Michael Adeniregun aka Slyde, gained popularity after he dropped his hit track “banana” where he featured Timaya. Slyde was nominated as “Rookie of the Year” at the 2014 headies. In a new interview, the artiste opened up to Punch about the driving force behind his music. 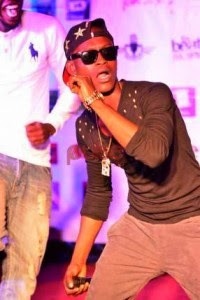 Slyde revealed that his case is different from most artistes as his father had always wanted him to become a musician. “My story can be interesting. While some fathers are apprehensive when their children indicate interest in music, my own father was my teacher, coach and mentor. He had wanted me to be a musician since the day of my birth. While I was growing up, he bought so many musical instruments like the harmonica, guitar among many others for me. So when I was becoming of age, I promised to make my father, Mr. Adeniregun, a very proud man. My parents were ecstatic when I began to show interest in music.